The Japan Karate Association - has been in existence since 1948. It has been in Australia for almost 40 years. We practice and promote Shotokan Karate from the unbroken Funakoshi - Nakayama - Sugiura line along traditional Budo principles. JKA has a wealth of collective knowledge within its ranks. As a student, you will be exposed to the teaching and guidance of some of the Karate world’s most highly qualified and talented people. The quality of instruction here in Australia is of the highest order. Home grown senior instructors and visiting Japanese instructors hold regular training seminars and are actively involved with every affiliated Dojo in the country. JKA Karate offers a practical and thorough approach to personal self defense. Waza (techniques) are practiced repeatedly with one or many partner opponents. This helps us to use force in proportion to any attack that is being made. Our aim is to develop in our students over time, the ability to make a natural and decisive response against physical acts of aggression - where necessary. Where the aggression is non-physical, our training helps us to diffuse a threatening situation in an assertive and non-violent way. 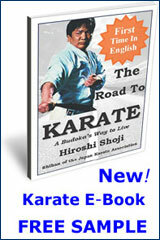 The Japan Karate Association is a world-wide association of people with a common interest. We are not a hybrid system, nor are we a one-man business or a multi-style group. JKA Dojos in Australia are affiliated with one of 4 regional administrations that have been set up by the Japan Karate Association World Federation (JKAWF) headquartered in Tokyo Japan. Few Martial Arts organisations have been around this long. 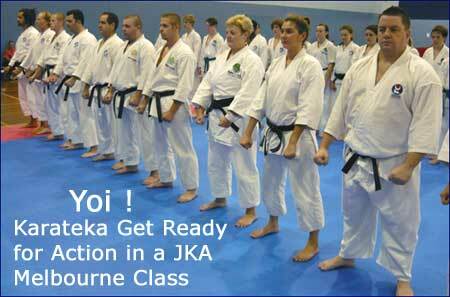 JKA in Australia has accumulated nearly forty years of technical and administrative experience. We are a stable and strong group and we will continue to grow and share our knowledge with many more generations of Australians. A JKA membership is confirmation that you are part of the largest single-style traditional Karate group in the world. If you visit an affiliated Dojo in Australia or overseas, you will find little or no difference in the training or the instruction methods. You will also find that because the JKA world family shares so much in common, that you will be warmly welcomed and invited to return. “Shiai” meaning ‘test of skills’ is part of our training. The rules of JKA competition are the same at Dojo, State, National and International level. As a member, you will be eligible to compete at all 4 levels and you will be properly advised how to do so by your Instructor. JKA Karate offers ongoing and positive personal self-improvement. Over time and with proper practice, certain physical attributes including body strength, suppleness and the ability to better focus on tasks in general are honed. Importantly, students develop the qualities of humility and self-confidence - desirable traits inside and outside of the Dojo. JKA Karate is a fantastic means to all-round fitness. Training is vigorous and exhilarating with a focus on speed, explosive power, range and flexibility. Endurance training is a feature of our advanced classes - but you will receive a full workout in any cass you attend. Karate is an oriental fighting, or “Martial” art practiced by people the world over. It comes from a fighting tradition and is potentially harmful. In the Dojo we practice with the utmost respect for our training partners and encourage students to behave in the same civilized way in their daily lives. Karate training begins and ends with respect. Our values are embodied in the Dojo Kun which is recited at the conclusion of every class.